With Summer winding down and the school year revving up, now is the time to start planning for your Holiday, future travel, and other variable spending requirements. Everyone's budget pushes and pulls every month. With a bit of planning, you can lessen the monetary shocks that inevitably happen. This set is characterized by monthly periodicity and size - i.e. the payment is required every month and is roughly the same each time. This set is characterized by unknown timing and also unknown amounts...not good qualities to have when planning expenses throughout the year. The planning process is further complicated by the timing of most people's compensation, which is typically twice per month in roughly the same amounts. Thus, we have equal payments spaced throughout the year to pay for some expenses of unknown amounts and irregular frequency. Bottom Line: Life happens to all of us. Fortunately, some tools and techniques can assist with combating these issues. An Estate Plan. Simply put, it's essential and if one does not exist...this item is #1 on the To-Do List until documents are properly executed. No Credit Card Debt. No viable Financial Plan can rely on Credit Card debt and its associated draconian interest rates. An Emergency Fund. While the amount will vary depending on the employment situation, I recommend every Client Have one. Focusing on the Emergency Fund for now, I can say that having one is an invaluable tool for times where you get caught out in a given month with unanticipated expenses. Living with a 6 or 12 month living expenses reserve is a very comfortable backstop in one's financial life. Moreover, the difficulty with actually getting to a fully-funded Emergency fund forces one to think very carefully about expenses requiring its use. Therefore, the world becomes more affordable when you have an Emergency Fund. Obviously, these amounts are not going to be exact to four decimal places, though that is not the intent of the exercise. Rather, we are simply trying to remove some of the variables so we are not caught out when the inevitable happens. There are many mental accounting tricks one can use with money. While money is indeed fungible (a dollar here is the same as a dollar there), if we subdivide money into separate accounts, we can more easily tackle the spending variables to which I previously referred. One tool frequently employed in financial planning is the "His, Hers, Ours" concept where each spouse has respective accounts for personal use and then another separate account is used for joint expenses. Obviously, you can add as many accounts to this mental exercise as you want - you are only limited by how many accounts you wish to mentally (or literally) track. 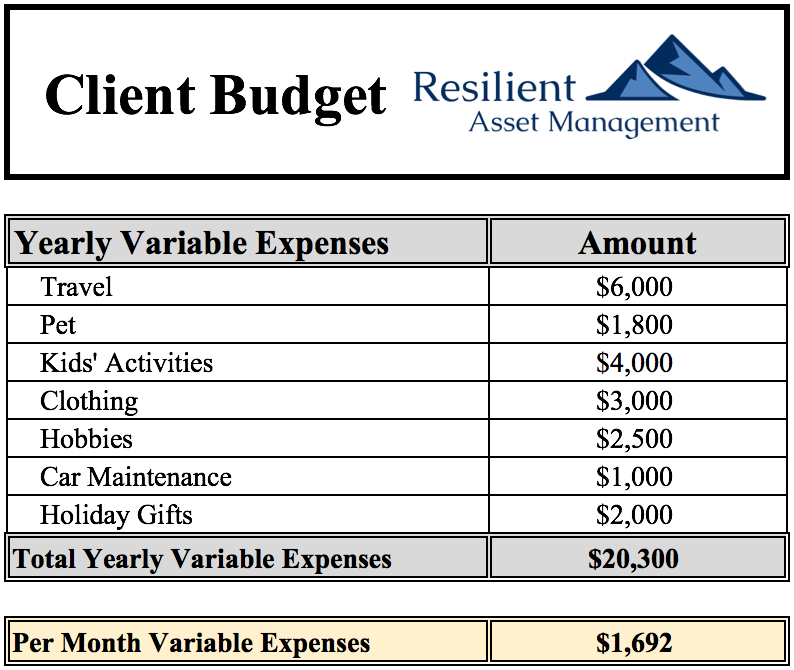 For my Clients who are challenged with variable spending issues, I recommend a totally separate account where a set amount is deposited every month. This amount is calculated by simply adding up the Variable Expense Estimate and then dividing by 12 as we did in the example above. 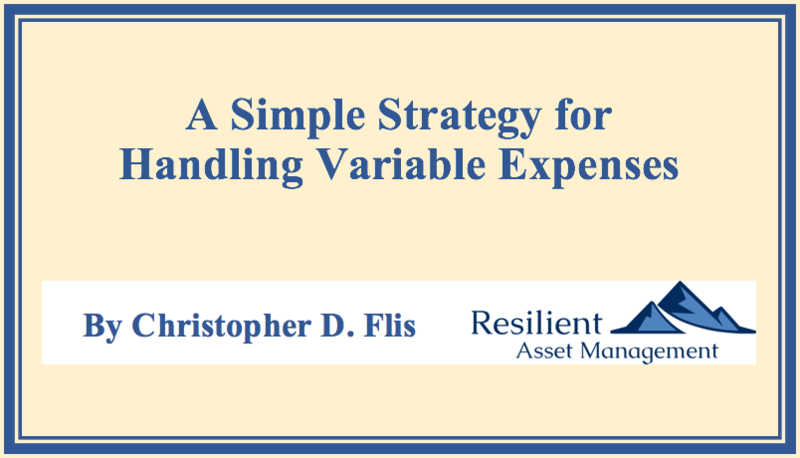 Then, when one of the variable expenses "pops up", we simply use funds in the Variable Account to pay - or at least mostly offset - for the expense. This technique is intended to smooth out expenses on a monthly basis. NetFlix instead of the movies. Taking care of home maintenance. You can develop your own list of options. My point is that not spending money does not mean you are forbidden from having a good time or getting other important things done. And never underestimate simplicity...a hand-written card is a wonderful to receive as it is inexpensive to send. President Eisenhower famously said, "Plans are worthless, but planning is everything." Having participated in many military plans in my time, I can attest to this quotes military validity. Concomitantly, I can also attest to the quotes applicability to financial planning. While anything can happen, I suggest making a good-faith attempt to adhere to your spending plan. Given that your spending plan ought to allow for a targeted amount of savings, adhering to the overall plan will allow for excursions like travel and memorable holiday experiences, while also permitting your savings to accumulate and grow over time. And that is the ultimate point of this drill: You want to be able to consistently save in an uninterrupted manner so you can grow your net worth over time. Obviously, we are not going to get all the pieces right in forecasting a year's worth of expenses. However, by going through the "Planning", our worthless "Plan" will have immense utility in easing our stress as we encounter unanticipated expenses. Also, and more importantly, you will be emboldened with the mindset that you can handle all the financial curveballs lying in wait for you.